More associations, in web services. 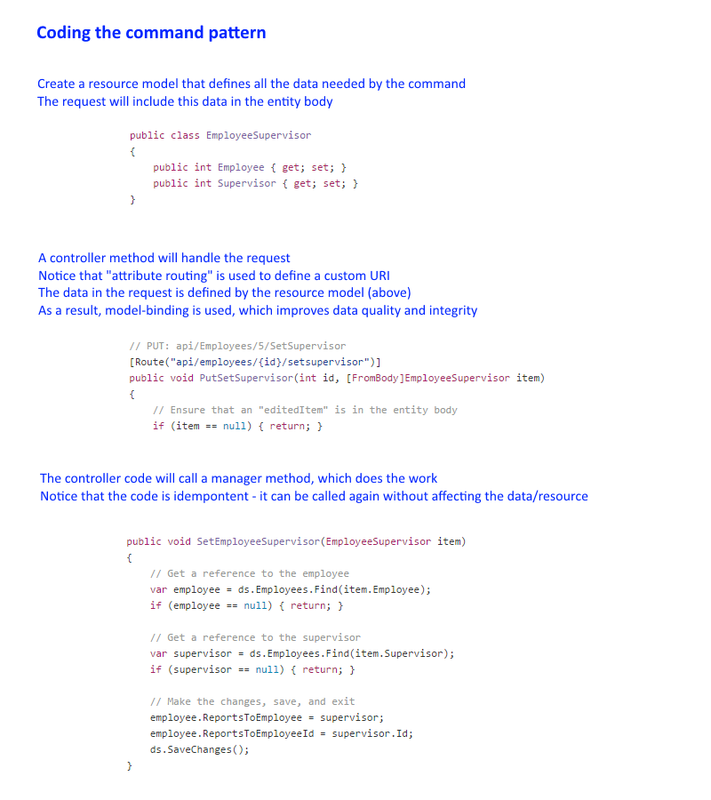 Command pattern. Test 3 is today. Likely done closer to the beginning of the timeslot. A reminder… It is possible that the test will include questions that “reach back” a bit, on topics that were presented in notes from the previous weeks. Make sure that you review those when you are preparing for today’s test. In your web apps courses, you probably had a reasonable treatment of the kinds of associations (relations) that data entities can have. In the previous class session, we refreshed your memory about one to many associations. The problem domain that the code example covers is a workplace. There are three entities, Employee, JobDuty, and Address. A workplace has employees. Employees have job duties, usually one or more. However a job duty is often performed by many employees. Also, an employee lives somewhere, and works somewhere – these are addresses. The class diagram below is from this week’s code example, AssociationsOther. Click to open it full-size in its own tab/window. An Employee has one “home” Address, and one “work” Address. From the Address perspective, it is linked to an Employee. How do you code this? In the dependent class (Address), add the [Required] data annotation attribute to the navigation property that points to the principal class. Here, in other words, add [Required] to the “Employee” property. Add another property, a nullable int. Its name is a composite name – EmployeeId. An Employee can have several “job duties” (e.g. professor, researcher, coordinator), and a “job duty” is performed by many Employees (e.g. School of ICT coordinators include Peter McIntyre, Ian Tipson, Nagham Kubba, etc.). Maybe surprisingly, this is also actually easy. Simply add collection properties to each class, similar to a “one to many” association. An Employee has a supervisor/manager, who is also an Employee. A supervisor/manager Employee has a collection of Employees supervised/managed. This is actually easy, as you may speculate. 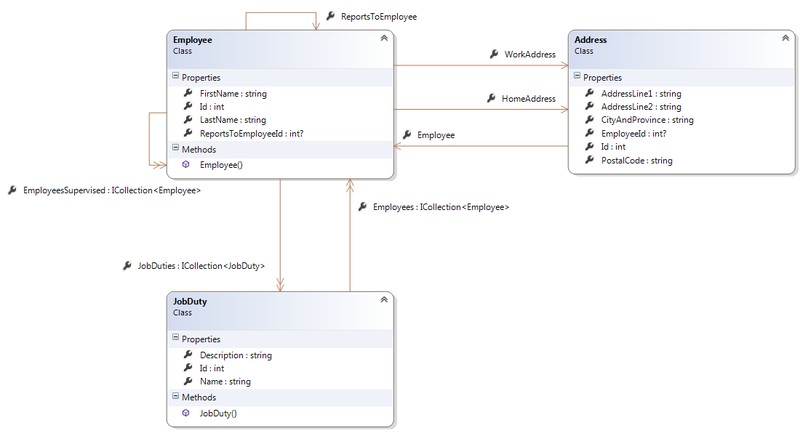 Simply add a collection property; its data type is the class data type. When you are writing entity classes, are associations required among all classes? It is not necessary to ‘connect’ every class to another. This technique is often used for data that is used for lookup or validation purposes. In this web services programming course, and in the prerequisite web apps programming course, we use a learning strategy that enables the student to focus on the important and most-used associations among entities. The Entity Framework, and its technologies, offers much more than we have time to cover in this course. Therefore, as you read/skim the linked resources below, use your critical thinking skills to put a topic into the proper context and usage pattern. In other words, don’t be literal in how you use and apply the information. The biggest difference-maker for us is that we are writing web services and web apps. As a result, operations on data are atomic – a read is done as a database server connection open, a read, and an immediate close. Similarly, a write is done as an open, a write, and an immediate close. Many of the discussions in the linked documents (below) are for runtime environments where a database connection is persisted as a longer-lifetime object. So, if you have questions about syntax and differences with what you’ve learned so far, ask your professor. In the past few weeks, we have been learning to design and code a web service by thinking of it as an API to a database-like data store. You have learned how to handle the typical CRUD operations (create, retrieve, update, delete) normally associated with data management. The HTTP methods map nicely to these operations, and that familiarity has helped you make progress. What kind of commands or operations could be done? Anything. For example, you could cause the web service to send a message (e.g. an email, or text message) to a list of pre-configured recipients, and then log the action. Or, it could increase the hourly wage 5% for all employees in a certain department. Or, set/save a photo for a resource. The point is that the web service is now doing a better job of servicing a use case. A web service is not always intended to be simply a thin layer on top of a data store (but sometimes it is). Instead, it is often intended to be a gateway to the wide-ranging richness of an application / problem / business domain – all of its operations and workflows. Today, you’ll get a gentle introduction to this concept. This will prepare you for more interesting scenarios in a few weeks. You can – and should – practice this concept in Assignment 3 later this week. Which is the more natural concept to understand? Everyone can understand #1. Only programmers would care enough to understand #2. How do we map commands to resources? By convention, we typically send a PUT request to a resource. The underlying method has code that carries out our intent. Study the following diagram, and then the AssociationsOther code example. Click the diagram to open it full size in its own tab/window. No, but it’s a principle named “command-query separation“, or CQRS. Therefore, the controller method return type will be void, which automatically creates an HTTP 204 status code. In other words, when handling a ‘command’, we simply execute the command silently, without any data feedback to the requestor (other than the HTTP 204, which is one of the HTTP success status codes). It is also possible that you could decide to return HTTP 202 (Accepted). Some developers and thought leaders advocate this alternative, for some situations. Please carefully read the RFC, and then decide whether it is suitable for your use case. Here’s a few other important things to know about HTTP. In HTTP, the GET method is safe. A safe method does not change the state of a resource. These methods are unsafe: POST, PUT, DELETE. We must also consider idempotence. In brief, a method is idempotent if repeated execution has the same effect. In HTTP, GET, PUT, and DELETE are idempotent. (Why? Think about it.) POST is not idempotent.